One of the most seminal influences on my own writing has been Bram Stoker’s classic novel, Dracula. The book is timeless, multi-layered with theme and motif and is, for all fans and writers of gothic horror, the ultimate bible of storytelling for this genre. Stoker was Irish-born, and lived in Clontarf, Dublin, and amongst the many myths and facts as to how he was influenced to create such a mystifying and captivating character and story, is the legend of how he came up with the idea of the ‘stake in the heart’ method for destruction of the vampire. In an area of North Dublin City, there is a place called Ballybough, meaning Poor Town. Situated between the Royal Canal and the Tolka River, in centuries past, this area would also have been known as Mud Island. In Stoker’s era, it was a renowned place for pirates that attracted prostitutes, drunkards and criminals. Many died there to be buried in pauper’s graves, but of course, in those times, being dead was not always as finite as it ought to have been! In the event of so many of these unfortunate creatures being ‘risen again’ (probably from drunken stupors! ), the authorities, having named the area, the Suicide Plot, decided to make sure that anyone falling down dead there, stayed that way. And so, wooden stakes were driven through the chests of the ‘corpses’ before the dirt hit their faces for the final time! Whether true or not, stories such as the above are nonetheless intriguing anecdotes that add to the myth and magic of Dracula. For fans and writers, as well as for film buffs, The Romance of Dracula; a personal journey of the count on celluloid, written and illustrated by Charles E. Butler, is a real treat. Not just for the pleasure of discovery, or re-discovery, of the vast array of wonderful actors who have played the legend himself, but also, this book is a ‘must-have’ reference, as well as being an entertaining read for anyone with a curiosity of all things vampiric! The author’s knowledge of the subject matter is vast, and his theories will make you want to revisit, not just the films he critiques, but also, to read Stoker’s classic novel again, such is the depth of exploration between the pages. In his quest for a critical assessment of the Dracula myth in movies, Butler, an avid fan and collector of vampire literature and film, has compiled an honest and detailed collection of synopses and reviews of fourteen Dracula movies. From Max Schreck’s Nosferatu (1922) to the author’s description of Hammer’s Christopher Lee as the definitive count (1965) to Gary Oldman’s portrayal in Coppola’s version (1992) and many stars and productions in between – you’ll find your favourite and perhaps, your least favourite, to measure and critique, and no doubt, learn new facts and theories on the count’s adventures on celluloid! 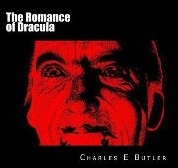 The Romance of Dracula by Charles E. Butler is available from Amazon…go on, treat yourself! This entry was posted in The Librarian's Cellar and tagged Ballybough, Bram Stoker, Charles E Butler, Christopher Lee, Dracula in Movies, Gary Oldman, Max Schreck, North Dublin, Nosferatu.